Well slap me in the face and kick me out of my doldrum! The last three days I’ve been moving like an old fart waiting for his renewed AARP card. Sloooowwwww! Yes, I did get Black-capped Vireo and Golden-cheeked Warbler, but I certainly haven’t been pushing the envelope. And last night I said today would be a travel day. The epiphany came 20 miles west of Del Rio when I realized that I’d arrive a Marathon by 2:30 PM. Plenty of time to drive into Big Bend NP and check out Rio Grande Village. Never mind that it’s 92 miles away from Marathon and the temperature was 106 degrees F when I arrived! I did locate the Common Black Hawk and a Poorwill after dark. However, now it’s 11:30 PM I’m tired and the youthful enthusiasm so prevelant this afternoon is long gone. I need to take some geritol and go to bed. For those of you reading this that don’t know John personally. . . you need to know that for him moving like “an old fart. . . ” is simply the way normal people move!! 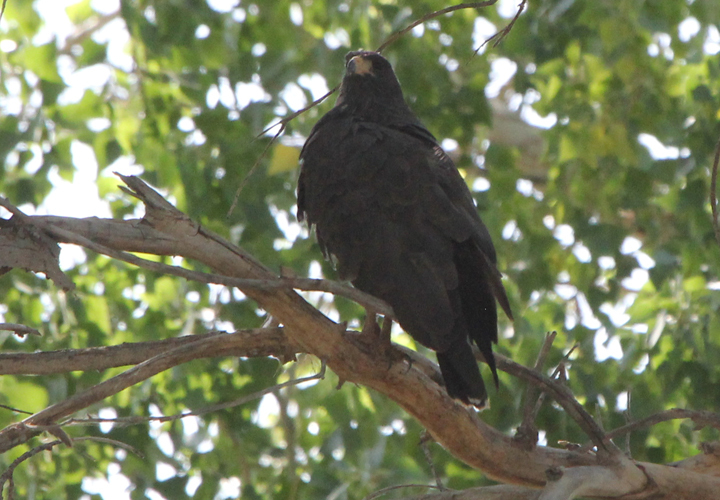 Well, Common Black Hawk is a great bird! Congrats! +1 and +2 update. I’ve been doing occasional updates that track John in terms of where he’s heading in you add his category 1 and 2 birds to those already see. As of 4/26 (518) he still had 91 unobserved category 1 species tracking him to 609 and 52 category 2 species tracking him to 661. I think that Common Black Hawk and Common Poorwill were both category 2 species for him, I don’t know what the third new species was today. Linda–“OF” seen in action and well understood. As a former UPS delivery person I just have to add, your energy could be tapped and used for moving a freight train down the track.